Weapons used by Wolf Brigade and Partisan Units. On the bottom the shoulder stock is attached as it would have to be for longer ranges, as in the case of the case worker positioned to ensure that if he did not execute the girl he/they would be killed. It was the weapon used to execute the prisoners in the ardentine caves in Italy by the German SS as can be read about or seen in the Movie "Massacre in Rome", staring Richard burton as an SS Major and Marcello Mastroianni as the Catholic Priest/Friend who is executed by Same. 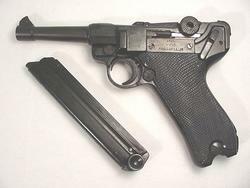 This is why the very sight of this Pistol strikes fear into the hearts of many Europeans even to this day. It has been used as an Icon of extreme ruthlessness and efficiency in many European and American films. In the American film, "Assault on Precinct 13" It was used by a gang leader to cold bloodedly execute an 11 year old girl. That is why the Directors chose it for the final scene in Jin-Roh. It is the singular most Evil (Iconic) weapon in History. 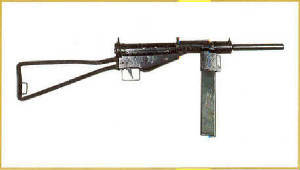 Below Left, is an MP-40 (Schmisser) sub-machine Gun. It fires the 9mm Parabellum (Lugar) round. It is issued to special troops and to security personnel. 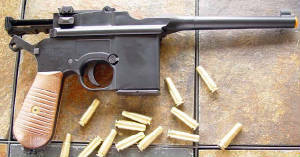 Known as a peerless submachine gun it was often picked up by American troops and used in place of our own firearms. It's Brother ,the Wooden stocked MP-41 can be seen below it. It is not to be confused with the Steyr machine Gun (Lower)which is used by Elite inner circle operatives later in the movie...it bears a resembelance to the sten but has no mechanical likeness. It has a wooden stock and perforated barrel jacket with a 32 round box magazine to the left hand side. 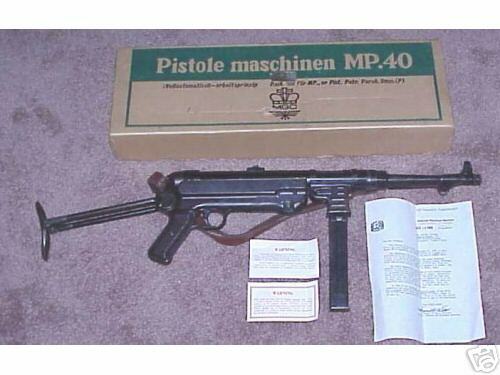 The MP34 is very well manufactured and often nicknamed the ‘Rolls Royce of machine guns’. The weapon has rifle type sights, provision for a bayonet to the right hand side of the barrel (a throwback to WW1) and can fire single shots or full auto. On the right, is the PO-8 or "Pistole Parabellum"(Lugar) . It is a personal weapon issued to Officers and Nco's as well as Special troops, artillery and message carrying Soldiers. Although not an evil looking pistol, It conjures up feelings of efficiency and precision. It is elegant and well balanced. The German Lugar commands respect. 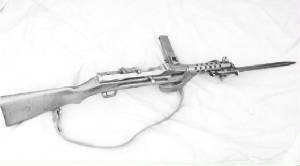 Below is the FG-42 "Paratrooper" rifle. It fires full or semi auto and is one of the most sought after war trophys of all time. We see just one of these (and only for a moment) in the movie. It has a scope adapter and so it can also be used as a sniper rifle. This weapon can turn a Soldier into a one man Army. Below (Left) is the German Copy of the British Sten and the British Sten itself, (on the Right). They both fire the 9mm Pistol round and differ mostly by the angle of the magazine which on the German copy is pointing downward and on the British, to the left. These were made in the millions and issued the world over. It is still a formatable weapon by todays standards. Current prices are at about $100.00 USC, each. Only 20 years ago you could buy them for $2.25 USC, each. They were an Icon of the Partisan fighter and the British Commando alike during the 2nd WW. A silenced version was made that used subsonic bullets. The Panzerfaust. 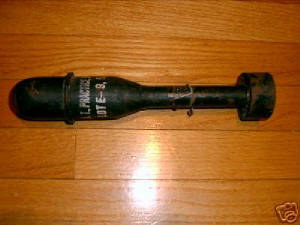 An individual anti-Tank weapon that could be disposed of after firing. Although very effective against armor or for breaching fortifications, it's effectiveness against personnel was limited. It's primary advantage was that anyone could master its use after a few tries. The U.S. Rifle grenade. This could have many uses as it was made in versions to be used against vehicles and personel alike. A High explosive, smoke, fragmintation, or gas version could be used. In the movie one is fired from a Mauser rifle. This is the only real error in the movie. It is made to be fired from U.S. Made weapons. However, it could possibly be adapted, but not likely, as there are German versions which work perfectly on the 98-K and need no adaptation. The German versions simply do not look as cool and there be the rub. The Mauser Bolt action 5 shot 98-K rifle fires an 8mm dreadnought cartridge.Way out of date for the type of combat in the movie but typical of that which is used in Partisan Fighting. The directors made sure that it seemed that the Partisans were useing anything they could get their hands on. This is used to fire the rifle grenade explained above. Such visuals give the impression of heroic and desperate action. The STG-44. Look out Ma-Ma...this was the first true Assault rifle. Icon of Special troops, the Directors make sure pleanty of "Special Unit" troops are seen shooting these. It is a formatable weapon by any standard. Last But Not Least is the "Molotov Cocktail". Favorite of anyone who's in dire financial straights and has a revolution or a war to wage needs plenty of theese. 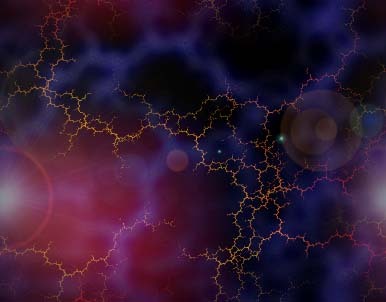 In the film, it is so stated that, "We have Lots". The Wolf brigade does not use these but sometimes hits them by accident causing unexpected mayhem. (Please do not try this at Home). This Finishes the segment on Jin-Roh / German weapons. Next will be an introduction of the main Players.